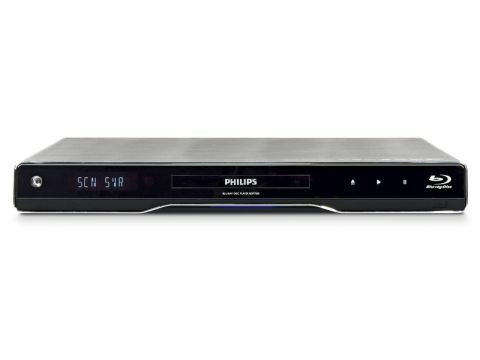 Now that entry-level Blu-ray players can be picked up at prices that are closer to what you'd expect to pay for a DVD deck, it's up to manufacturers such as Philips to deliver a deck that restores a slice of status to the hi-def format. And the good news is that with the BDP7500, Philips has done just that. Justifying its mid-range price tag on several fronts, this super-stylish player can deal with almost any video format on disc or USB, while removing the fuss from BD Live. As we've come to expect from Philips' TVs, the BDP7500 boasts a stunning design, which comprises touch-sensitive buttons located behind its mirror finish, plus a central blue light. Although connecting to BD Live is a cinch, bear in mind this deck is not Wi-Fi -equipped, so you'll have to place it close to a broadband router. And despite its easy setup and 1GB of built-in storage for downloaded content, it doesn't dabble in home networking. None of these omissions are a crime considering the £200 price tag, especially since it has other skills that cheaper decks can only dream of. Chief among these is its support for 7.1 surround sound and both the Dolby TrueHD and DTS-HD Master Audio lossless audio formats found on Blu-ray discs. It's also compatible with a variety of music (WMA and MP3) and video (DivX, DivX HD, AVCHD) files, all of which can be played via a USB stick or disc. One of the levellers when it comes to judging Blu-ray players is the disc playbck speed, which can be terribly slow even on high-end decks. That's not the case here, with the BDP7500's displaying disc menus inside 26secs – twice as fast as some rivals. The remote control, while good looking, isn't especially easy to use and while the button layout is logical, it's just too small and lightweight. There's a dedicated control for BonusView material, and a useful Home button if you ever get lost, but it can be unresponsive, requiring double clicks to get a particular command to work. The BDP7500's home screen presents some simple choices: play disc, access USB, or adjust settings. The latter is where you'll find some basic picture settings (Standard, Vivid, Cool, Action, and – unusually – Animation), as well as an option for beefing up black levels. Setting up BD Live is a simple process thanks to an effective network wizard that connects to the portal in seconds, with no WEP key required. Connecting to BD Live content on one of our test discs took only a few seconds. As we've come to expect of Philips TVs, this player turned in some very impressive results. Challenging scenes from our Up Blu-ray during the storm sequence demonstrate that the BDP7500 is capable of some incredibly robust black levels. Daylight scenes in the jungle, meanwhile, reveal a deft touch with tone. Switching to a movie with real-life action shows that this isn't a one trick pony, displaying satisfying detail partnered with judder-free motion and impeccable fine detail presentation. Switch to DVD and the BDP7500 continues to come up with the goods. Watching Battlestar Galactica, we were blown away by the rendition of fine detail alongside a complete absence of noise and judder. The only potential flaw occurred when playing back our Silicon Optix HQV Blu-ray, which showed some difficulty with suppressing jagged edges on diagonals and moving objects. Multimedia capabilities are equally impressive, particularly with DivX HD files. A downloaded trailer for Up In The Air, played from a USB stick, is beautifully presented with plenty of stability, colour and detail. When it comes to the BDP7500's sonic chops, it quickly becomes clear that this is a movie machine, rather than a music one. Lossless Dolby True HD 5.1 via HDMI provides a powerful soundstage with subtly distinct effects. Stick in a CD, however, and it all sounds a bit flat, while MP3 and WMA files lack potency. Overall, the BDP7500 just about manages to keep pace with its rivals. Its core skills with Blu-ray and DVD are in no doubt, but its lack of Wi-Fi and home networking mean that it's not quite able to match the better decks on the market. Assuming that these features aren't of interest to you, it's well worth an audition.